It is our objective to give the customer the most complete information possible about the capabilities of the Altrad Belle and our products. In this section of the website, we offer a range of literature and media to help you in any way we can. Product Catalogues - include images and specifications for all products within our range. Information on ‘Altrad Belle and the Environment’ and HAV (Hand Arm Vibration) can also be found within these catalogues. 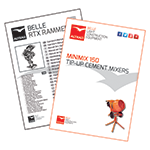 Product Brochures - include all the relevant technical information for our vast range of construction equipment. Operator/Workshop Manuals - include information on how to safely utilise and maintain our products. These are available in a number of languages including: - French, German, Spanish, Russian and many more. Spare Parts information can also be found within these manuals but if you would like to purchase your Spare Parts online, please click here. Hints & Tips - This section includes a number of small snippets of information that will help you get the best performance from you machine. Image Library - Download high quality JPEG images from our extensive range of action and studio shots, for all products within our vast range. Video Library - Watch from a large selection of operation and demo clips from products within our range. FAQ's - Solutions to the questions which are on everybody's lips. Warranty Registration – Congratulations on purchasing your ALTRAD Belle product. You can now register your product Warranty online. If you require further information please do not hesitate to contact us. Click here to contact us.